Mother's Day, Probably the Most Important Person in Your Life - Wood Palace Kitchens, Inc.
Mother’s Day has to be one of my favorite days of the year. It’s that one special day that we get to celebrate the moms in our lives and to show them how much we appreciate them. Granted, we can show them how much we value them in our lives every day, but this one day makes it that much more special for them. It’s a great day to look at how much our mothers really mean to us and how much they contributed to the person we are today. OK, so what can we learn from this day? Maybe how we can become better children? Maybe visiting them more or helping them do things around their home? I’m sure that we can think of a lot of great ideas that would help them out in their lives now, just like they did for us all of those years. 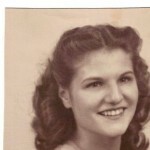 I was a lucky one; I had my mother for 53 years of my life. My mother taught me so many things along the way that I lost count a long time ago. She did teach me to love unconditionally. She also taught me to persevere, no matter how much I wanted to quit. She taught me to respect myself first and then others. She taught me to respect all woman, no matter the circumstances. It would take me days to complete a list on what I learned from her over the years. I just wish I had paid more attention to her thoughts back then. I would have propelled my life so much further with her wisdom and knowledge of life. As I sit here and reflect, I couldn’t have been blessed with a better woman to take care of me all of those early years. Mothers definitely take the most abuse of any human being that I know. They have so many things that they have to accomplish daily, 365 days a year. They never complain much unless you are out of line. Think about all that they do for you. They cook, they clean, they do the laundry, they comfort you when you are sick, they run you around to school and activities, and they love you unconditionally. My mother was old school when it came to bringing us up, so she was the one who did everything for us but also disciplined us when we crossed the line by giving us a smack, pinch, or the guilt story to make us feel bad. I think the guilt story always worked with me. The other thing we seem to forget is that they weren’t born mothers. Just like us with our own kids, they learned as they went along. I remember my mother always telling me that she didn ‘t know much about cooking when she got married. She just did it and took the ribbing from my father till she got better. I can still remember when I first moved out on my own and calling her to see how to cook this and that. Thank God I had her, because I probably would have starved or gone broke from eating out. My mother ended up being a great cook over the years and my stomach was always happy about that, for sure. There is nothing better than a home-cooked meal from mom. Loved the hot turkey or roast beef sandwiches she always made the next few days after Thanksgiving or other holidays. Over the years we have realized that mothering comes from instinct and from the heart. What is right one day might not be the next. With five kids in our family, she had her hands full but she loved us all the same but different. She was the boss and she let us know it. I’ll have to admit that there were many times that I did not agree with her back then, especially when she stopped me from doing something that I wanted to do. Now that I have been a parent, I see that she was wiser than I thought and she was only protecting me, my reputation, or in some cases, my life. When we get to an older age and our mothers are gone, memories are the only things that we have to hold onto. I often sit there and smile at some of those memories. The times when I would wake up in the morning and the smell of coffee and bacon lured me to get up and run down to the kitchen. The times when I would be frustrated or didn’t believe in myself, and she would know just the right words to say to make me feel better. The times when she would fluff my pillow when I was sick. The times when she would get frustrated at us and tell us she was giving us back (lol, that was my favorite). And the best memory of all was when she would just hug me and made me feel that everything was going to be OK. The woman was a saint when I look back at all that she had to deal with over my life as a child. Mother’s Day is Sunday this week, so prepare yourself early. It’s time to start looking for that special gift that will make her smile. Whatever you decide on, you need to give all of yourself, and your heart like she will most likely do for you the rest of the year. You need to hug her and kiss her like she will be gone the next day. You need to make her feel special just like she has always done for you. Mothers are truly a gift from God, so don’t waste any time while you still have her. And most of all, don’t dare take her for granted! I’m here to tell you that when they are gone, they are gone. Treasure your time with her! Enjoy this coming Mother’s Day, my friends. Make it a special day for her and your whole family. 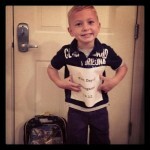 Who else on earth could have made us smile like the picture of my grandson on his first day of school? Only our mother, that’s who! Happy Mother’s Day, Ma, up there in heaven. You were an incredible woman and mother. My love for you burns on and on. I miss you more each passing day! God Bless! This entry was posted in Inspiration on May 5, 2016 by wpalace.